Yes. See, for example, this post from three years ago. "We report a puzzling pair of facts concerning the organization of science. The concentration of research output is declining at the department level but increasing at the individual level. For example, in evolutionary biology, over the period 1980 to 2000, the fraction of citation-weighted publications produced by the top 20% of departments falls from approximately 75% to 60% but over the same period rises for the top 20% of individual scientists from 70% to 80%. We speculate that this may be due to changing patterns of collaboration, perhaps caused by the rising burden of knowledge and the falling cost of communication, both of which increase the returns to collaboration. 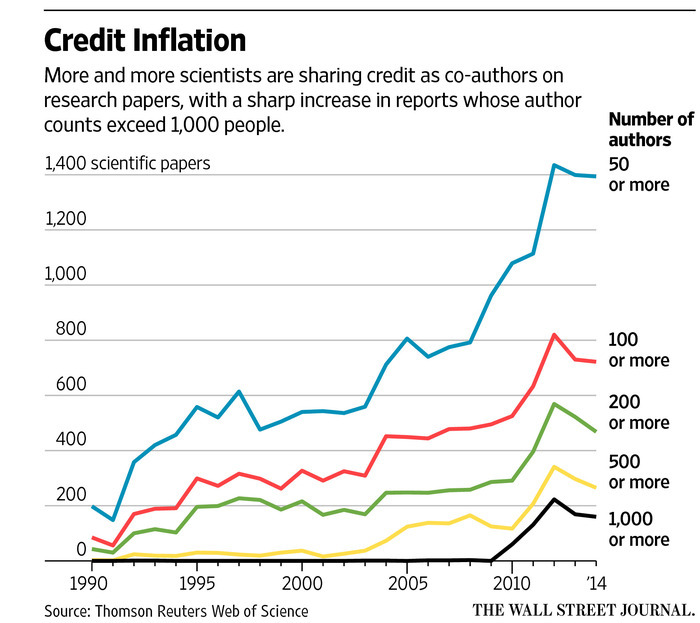 Indeed, we report evidence that the propensity to collaborate is rising over time."